The best description I have heard of Sir Alex Ferguson’s strategising is that he is a tactical magpie. Some managers have gone down in history as greats thanks to their innovation as well as their success – the passing of Jimmy Hogan’s various sides, the movement of Gusztav Sebes’ Hungary, the universality of Rinus Michel’s Ajax – but not Ferguson: his success has been based upon observing the tactics of others and taking what works best. The greatest example of this was one of Ferguson’s more recent sides. The rise of Chelsea thanks to Roman Abramovich’s millions meant Ferguson was going to have to rebuild his side if he was going to compete with Jose Mourinho. The acquisitions of Edwin van der Sar, Patrice Evra and Nemanja Vidic in the 2005-06 season and the sale of Ruud van Nistelrooy to Real Madrid over the summer was sufficient to bring the Premier League back to Old Trafford the following season, with Cristiano Ronaldo and Wayne Rooney flourishing now that the emphasis had been taken away from simply trying to feed Van Nistelrooy. It wasn’t until the next season however that the side really hit their peak. Th fetishisation of Luciano Spalletti’s strikerless Roma side by those interested in tactics means the story is widely known but we will run through it once more. An injury crisis meant Roma were left without any natural strikers, so Spalletti came up with a bit of a makeshift system so they could get by that involved putting talisman Francesco Totti up front by himself – what set it apart though, was that Totti was by and large allowed to play his normal trequartista role, coming deep to pick up the ball and create for his teammates, only without a striker ahead of him. The problem this posed for the opposition was that, as far as they were concerned, Totti was leading the line for Roma – the number nine – so his movement deep posed a problem for the centre-backs who should have in theory been marking him. However, to mark him they would have been dragged up the pitch, leaving space for the wide players to cut into, yet leaving him meant he was unmarked and could do as he liked, while the centre-backs were essentially left with nothing to do. Ferguson was impressed enough by the catch-22 situation Roma created to apply the tactics to his own side, despite thrashing them 7-1 in a Champions League game that year. For Roma, striker Mirko Vucinic would pose a major threat from wide left once he returned from injury, but the major goal threat of that side was still from the highest central player in Totti, who, with no striker ahead of him, had space to move into in front of him and finished as the ESM Golden Shoe winner with 26 goals. 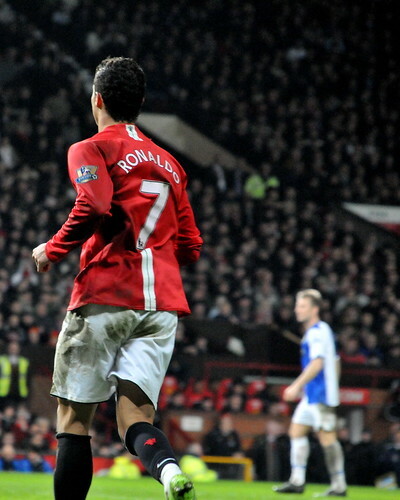 Ferguson instead made wide player Ronaldo the focal point of his attack, having Rooney or Carlos Tevez drop deep to confuse the defenders so that Ronaldo could come inside to devastating effect. The most basic notation would have it down as a 4-3-3 – there were clearly four defenders, three midfielders then the tridente up front, but the lack of a number nine means many have it down as a 4-6-0, while it also shares many similarities with a 4-4-2 (proving how rubbish these ways of identifying formations can be). The personnel frequently changed, as did the shape given the system’s flexibility, but the general set-up was Van der Sar in goal, Rio Ferdinand and Vidic at centre-back, Evra left and Wes Brown right, whose use has been discussed on the site before. In front of the defence was commonly a combination of two of Paul Scholes, Owen Hargreaves, Michael Carrick and Darren Fletcher, then to the left of them would often be Ryan Giggs – however, no longer the spritely winger that terrorised defences in the nineties, he would often come inside to the point you could count him as another central midfielder, which allowed Evra room to overlap. In attack were Tevez, Rooney and Ronaldo. Tevez and Rooney could be identified as two false nines, although Rooney would often play more to the left, while Ronaldo would be wide right, but being United’s focal point he was encouraged to come inside and use the space Rooney and Tevez would engineer. And use it he did: 42 goals and performances that earned him a host of personal awards led United to the Premier League title again, but also to the Champions League, defeating Chelsea on penalties in Moscow. Despite the big money signing of Dimitar Berbatov, United appeared weaker in the 2008-09 season. Maybe it was that other teams had become better equipped to stop them now they had a chance to observe them, maybe they struggled to cope with the extra fatigue the Club World Cup brought or perhaps Ronaldo just couldn’t pull off the magic he had the year before. Regardless, United’s success increasingly became about grinding out victories, depending upon their rock solid defence. There were a lot more binary-esque scores than the season before but they were still getting the necessary wins, with Van der Sar setting a new world clean sheet record after 1302 minutes without conceding a goal. They beat a away a good challenge from Liverpool to win the Premier League again and added the League Cup and Club World Cup, but missed out on the Champions League after coming up against the first year of Pep Guardiola’s Barcelona in the final. There was only one year of breathtaking brilliance from this team, but it says quite a lot about that year for them to have made it onto this list. Is Arsenal the economic role model for English Football? Man Utd 2006-09, a great team ???????????????????????????????????????????????????? For all their domestic dominance, Man Utd have NEVER EVER done these things.